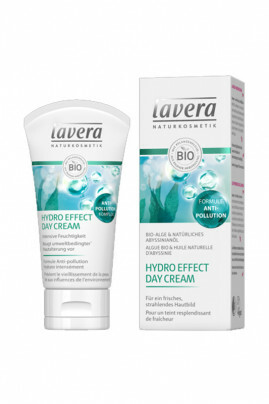 Lavera Vegan Organic Hydro Effect Day Cream is specially formulated to protect the delicate skin of the face from external aggressions and environmental influences such as air pollution. Its anti-pollution formula, composed of organic seaweed and natural antioxidants, will intensely moisturize the skin and prevent its premature aging due to free radicals. The anti-inflammatory properties of the seaweed strengthen the natural defenses of the skin by providing protection and comfort. Innovative in its water-repellent texture, the Vegan Organic Hydro Effect Day Cream envelops the skin with an invisible protective film that acts as a barrier against impurities. Your skin is hydrated, fresh and protected! Usage tips for naturally protected skin ! In the morning, apply Vegan Organic Hydro Effect Day Cream on your face, neck and décolleté previously cleaned and dried. Make the treatment penetrate by making slight circular movements. For a natural anti-pollution routine, we advise you to apply before your day cream. The protective action will be reinforced! Vegan & Organic Hydro Effect Serum - Anti Pollution. To thoroughly remove impurities from your face, apply Vegan Detox Effect Mask at least once a week. Vegan Organic Hydro Effect Day Cream has a natural composition !